I couldn't come home during Spring Break without having a cupcake. I don't even particularly like them, but I felt compelled to visit Kara's Cupcakes that had recently opened a store in the Marina. Now that they have a retail shop, I don't have to order the cupcakes by the dozen. The space fits the perception of a cupcake shop. Pink, small, and dainty, the store houses a glass case of the variety of cupcakes. Flavors include: Ghiradelli chocolate, sweet vanilla, vanilla chocolate, buttery buttermilk vanilla, chocolate velvet, coconut, Kara's karrot, banana, raspberry dazzle, java, passion fruit, meyer lemon, banana caramel, and fleur del sel. 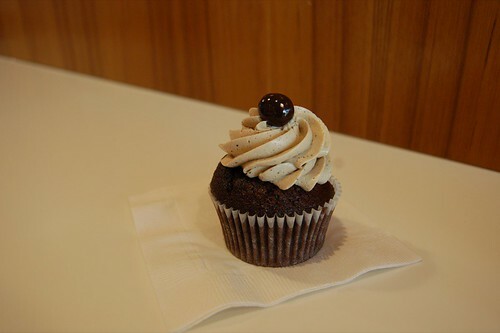 Being the insomniac coffee fan I am, of course I opt for Java, which is a chocolate cake with espresso buttercream. It's good, but not as good as Sugar Sweet Sunshine, which had the moistest cake and smoothest buttercream. I guess I still don't really understand the cupcake craze, but I will keep trying them until I do. Ithaca has been uncharacteristically hot, but alas, I only get to enjoy the nice weather from indoors. Being a student is a 24 hr job, especially during finals. That said, school ends in about a week or so, but I don't get to head back to California at all the entire summer. I'm sure Manhattan can handle my ravenous appetite, though a good portion of those meals will be takeout in the office. I guess that's "living the dream." 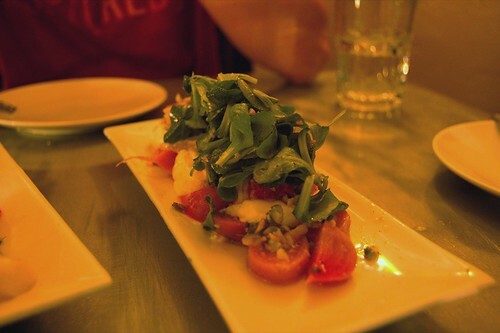 During spring break, my coworkers from my summer internship and I rendezvoused at Bar Crudo. I had wanted to try it for a while, being a fan of raw bars and all raw things in general. I also knew that A's humor and M's wine expertise would make for a night of fun. 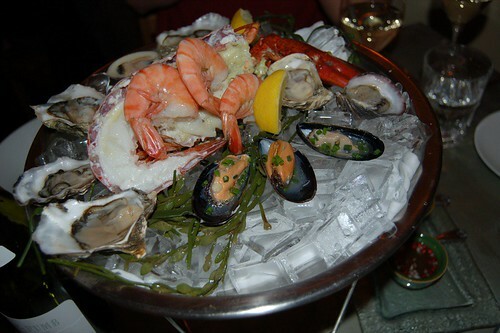 We started off with the seafood platter, which consisted of a variety of oysters, shrimp, clams, mussels, and lobster. I really liked the oysters and clams, but I wasn't so enamored by the lobster. The platter usually comes with 1/2 crab, but they were out that evening. I don't really dig lobster unless it's sous vide, and the lobster that night was way overcooked to the point of rubbery. I always get very excited with crudo samplers. I reminisce about the fluke tasting I had at Le Bernardin, which thoroughly blew me away. 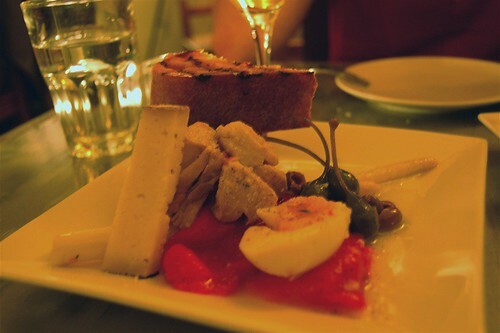 The sampler at Bar Crudo was a hit or miss. The fish was fresh, but the flavor combinations make or break it. I really liked the spicy yellowfin tuna cubes; slightly sour and spicy with a hint of ginger, it was definitely very refreshing. The scallops and fluke were good also, and I really liked the golden beets in the fluke. The tombo tuna was quite offensive, however. The vanilla vinagrette was way overpowering and artificial-tasting, and with the slippery lobster oil, the fish came to taste like a limp piece of plastic. Our server mentioned the arctic char, which wasn't on the sampler. This actually turned out to be my favorite crudo of the night. I haven't had char much before, but with its red hue and fat content, I had assumed it to be related to salmon and steelhead. The char had a great creamy texture, without the pronounced taste of salmon. 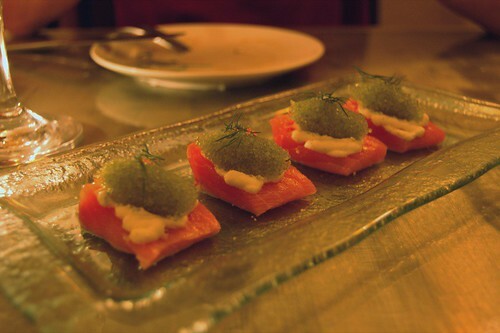 The light horseradish and wasabi tobiko also added a refreshing accent to the char. Next time I would only get this and the yellowfin tuna cubes instead of a sampler. The salad was pretty standard but good nonetheless. I celebrated the return of the baby beets, but I was not so fond of seeing the lobster. This time it was ever-so-slightly overcooked, but the rest of the salad was good. I read that the San Sebastian is the thing to order at Bar Crudo. Ironically, it turned out to be my least favorite dish of the night. The ingredients resembled a salade Niçoise, sans the lettuce. I suppose I don't like cooked tuna at all, but this tuna was just really overcooked. Since the highlight of the dish was ruined, I lost interest quickly. We ordered one hot dish that evening. 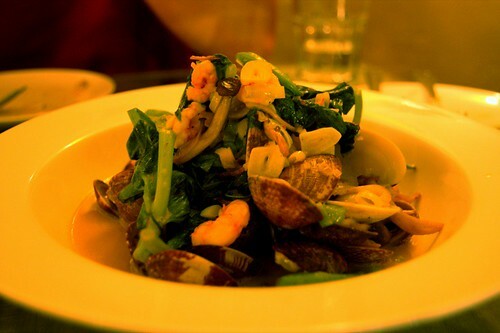 The clams and shrimp were fresh and the pea shoots delicately cooked, but the broth was too salty. 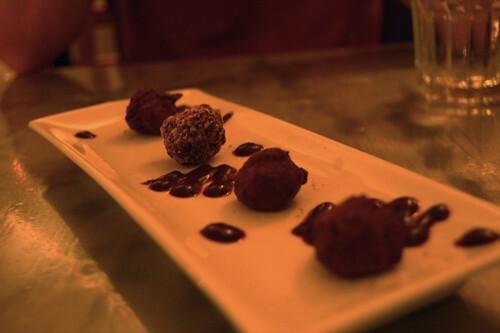 Bar Crudo only offers truffles for dessert, and I believe they were from XO. Overall, our meal was a hit or miss. 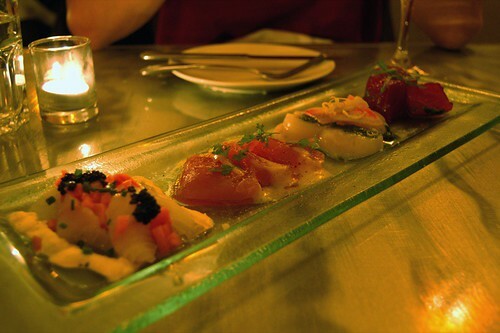 I would probably only stick with the crudos next time, specifically the arctic char and yellowfin tuna. Cute restaurant and nice staff though. Back to my Bay Area posts. Sorry for jumping around so much, but I still have not yet figured out the order in which I post. I like to think of it as something like a complex algorithm, except it's just more like what I want to talk about at the moment. I'll prob concentrate on SF for the next two weeks until I move down to NYC. 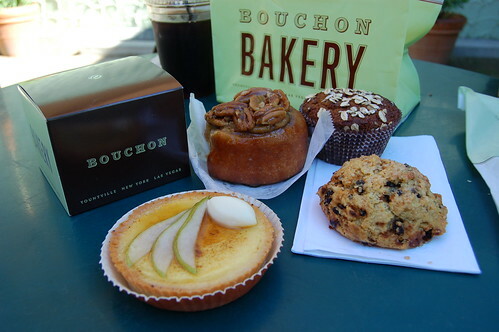 One day during spring break I decided I really wanted Bouchon Bakery goodies. So on a whim, we drove north to Napa and decided that we would just wing it. I was in the mood for some savories, so we first made a stop for lunch. I had in mind to try the Boon Fly Cafe at the Carneros Inn, but I missed it on the highway and ended up in downtown Napa instead. I had heard good things about Pilar, but they were closed for lunch. We parked near the mill, and we wandered around there, stumbling upon Celadon, which is owned by the same guy as Cole's Chop House. 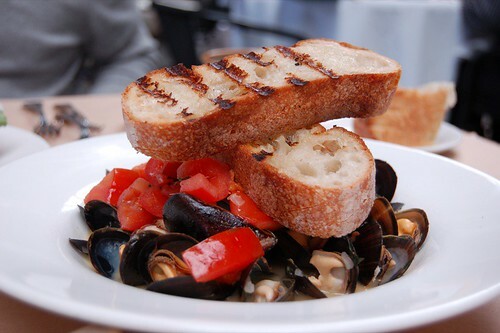 The menu seemed light and Californian, and also featured mussels. I was sold. Napa has beautiful weather, and that day was no exception. 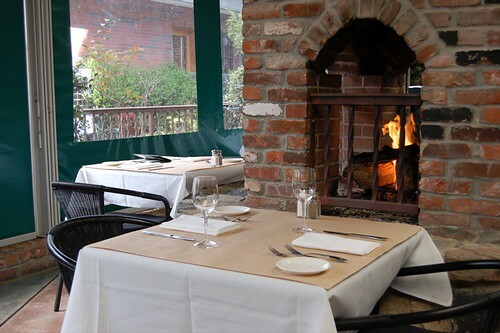 We opted to sit in the heated patio near the fireplace. 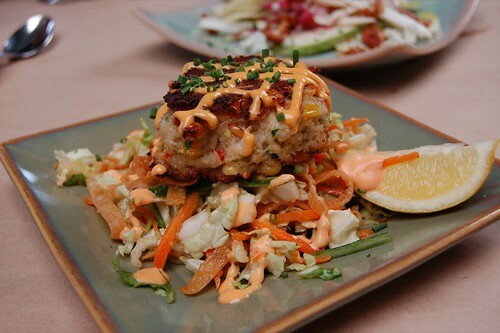 We started off with the crab cake, which was fine but nothing exceptional. The crab was jumbo lump and pretty fresh, but it arrived lukewarm and a bit hard. One could even say it had too much structural integrity - it was a hard puck of crab, and I would have preferred it a bit softer, more prone to fall apart. The asian slaw was pretty uninspired too. I really enjoyed the salad, however. 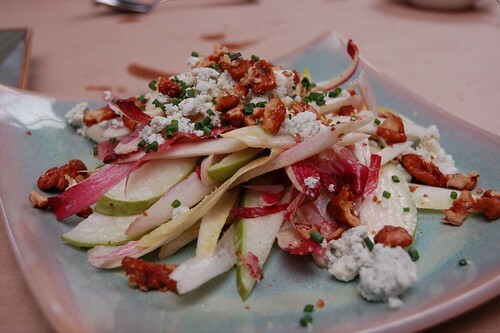 Everything was super fresh and crunchy, and the bitterness of the endives (one of my favorite vegetables) was nicely offset by the walnuts and honey mustard vinaigrette. The best thing, though, was definitely the mussels. I usually get my mussels fix from Lulu or Plouf, and I must say that Celadon's mussels were plumper, juicier, and fresher than both restaurants. If mussels could be obese, these definitely were. My only discontent was that the bacon was a bit overpowering in the broth, which could have used a lot more white wine. In terms of the broth, I still prefer Plouf's white wine, garlic, and parsley broth. That seriously is like my elixir of life. 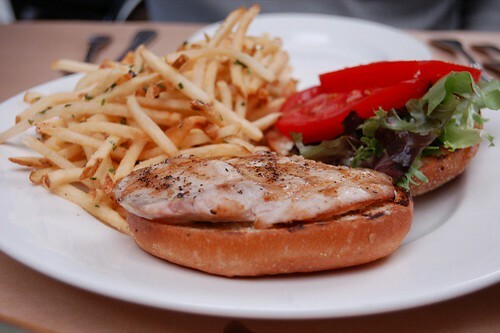 I really enjoy fish sandwiches (or fish anything), and this did not disappoint. I am not particularly a fan of mahi mahi, but this was nicely grilled so it was not overdone. The fries, which were cut a bit thicker than shoestring, were pretty good as well. 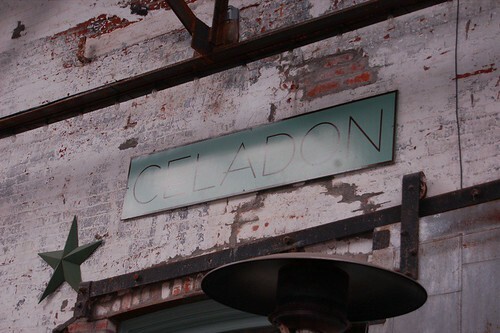 Overall, lunch at Celadon was pretty enjoyable and leisurely, especially on the patio in the beautiful weather. The prices were very reasonable as well. My only complaint is just that it was a bit TOO leisurely. Perhaps I'm just used to being in a banking mindset, but Celadon's service was just so laidback I became uncomfortable and ADD. We could've sat there all day unbothered if we wanted. Afterward we headed over to Bouchon Bakery, the very reason we drove up there in the first place. We indulged on a sticky bun, scone, bran muffin, and pear tart. All were good, but the scone really stood out. Flaky and buttery, it stood up to Citizen Cake's scrumptious buckwheat scones.